Please refer to our stock # 3503 when inquiring. 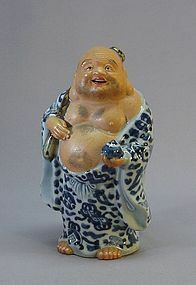 This hand painted blue and white statue of standing Hotei is a Taisho period (1912~1926) product. It is 6 ¾” high, 4” wide and 3” thick. In Japanese or Chinese culture, Hotei (Budai in Chinese) is an immortal who is always shown smiling or laughing and carrying a huge cloth bag. This porcelain Hotei is holding a wood stick in his right hand so he can carry both his huge cloth bag and a fan. His left hand is holding a round pot. His body is the only part unglazed. It is in great condition.